This Day in Presbyterian History · February 14: The Gospel the Wisdom of God. February 14: The Gospel the Wisdom of God. On this February 14th, what better subject to occupy our minds than our Father’s love for His people, as so powerfully expressed in His sending His Son to tabernacle among us, living a perfect, sinless life and then to die upon the cross in payment of our sins! Last week we spoke of funeral sermons as an overlooked yet useful literature. Another useful literature rarely utilized would be the class of sermons preached at the ordination of some new pastor. Our example today comes from the ministry of the Rev. William Buell Sprague, and in this sermon, delivered at the ordination of the Rev. John P. Cleaveland (a pastor I’m fairly sure none of us have ever heard of! ), Rev. Sprague delivers a powerful message from the text of 1st Corinthians 2:7. There is much to think about in this sermon, and I’m pleased to find that our friends over at Log College Press have a scanned copy of the full sermon available at their web site—click here to view the full text. Our text reproduced below comes from the first few pages of the published sermon. The Gospel the Wisdom of God. A Sermon preached at Salem, February 14, 1827, at the ordination of the Rev. 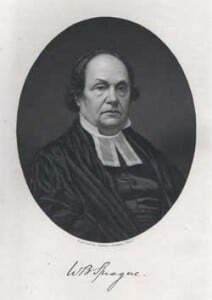 John P. Cleaveland, as Pastor of the Tabernacle Church, by William B. Sprague, pastor of the First Church in West Springfield. Salem: Published by Whipple and Lawrence, 1827. But we speak the wisdom of God. the latter with the sublime appellation of the wisdom of God. By wisdom, in its most general acceptation, we understand knowledge accompanied with a disposition to make a right use of it, As an attribute of the divine nature, it is omniscience directed by infinite benevolence. When the Apostle, in our text, styles the gospel the wisdom of God, I hardly need say that he does no lean to intimate that this is the only instance in which this attribute has ever been displayed ; for Wisdom lifteth up her voice in every part of the creation. From the seraph that burns before the throne, through all the grades of animated nature, down to the insect that glitters for an hour; from the immense globe which we occupy, through all the combinations of matter, down to the mote which is visible only to a microscopic eye, there is nothing—however vast—however minute, on which the Creator has not left the traces of his wisdom. The meaning of the Apostle, then, obviously, is, that the gospel is the brightest, exhibition of divine wisdom ; that it gives us a higher view of the only wise God than any thing, either in the natural or moral world, which has ever been made known to us. With this explanation of the passage, I shall endeavor to illustrate and establish the proposition, that THE GOSPEL IS THE WISDOM OF GOD : and I shall pursue this design by showing, First, that the gospel accomplishes the noblest purposes by the best means; and Secondly, that it accomplishes many, and apparently opposite purposes, by simple, and apparently improbable means. I. The gospel accomplishes the noblest purposes by the best means. The grand purposes to which I refer, are the glory of God, and the happiness of the intelligent creation. The means employed for their accomplishment, is, in general, the mediation of the Son of God; comprehending all that he is, and all that he does, in his prophetical, priestly and regal offices: Or, that our view of it may be still more simple, we may consider the glory and efficacy of the whole scheme, as centered in his atoning sacrifice. The gospel, or the scheme of Christ’s mediation, which is the substance of the gospel, is admirably fitted TO PROMOTE THE DIVINE GLORY ; or to make an illustrious exhibition of God’s moral perfections. It accomplishes this object better than it could have been accomplished, by an unconditional and absolute pardon, which should have been merely an act of God’s sovereignty. Man, in becoming a sinner, broke in upon the order of the universe, and committed an act, which, in the eye of the divine law, was a capital offence against God’s moral kingdom. If, then, this offence is to be pardoned unconditionally, how will the Almighty Sovereign vindicate his moral character, in the view of the intelligent creation ? What will become of his justice, if he can see his law shamelessly trampled upon, and never lift an arm in its vindication ? What will become of his holiness, if he makes no distinction in his government between virtue and vice, and extends his protection alike to the good and the bad ? And must not his faithfulness too fall in the general wreck, if he does nothing to guard the sanctions of his violated law ? I maintain, then, that the unconditional forgiveness of sin, by a simple act. of divine sovereignty, must, according to all rational views of the divine government, have been derogatory to the character of God; and that there was a moral necessity, growing out of the nature of his administration, for some public declaration of his views of the evil of sin. If this scheme of unconditional pardon displays the mercy of God, it is mercy at war with justice and holiness. But in the death of Christ, as our ransom, the character of God, as a moral governor, stands completely vindicated. His justice is exhibited in the regard which he has shown for the honor of his law; for while he reverses its condemning sentence, in respect to the penitent, it is in view of the fact, that Christ has borne their sins in his own body upon the tree. It is holiness is proclaimed in the fact, that sin was, in his estimation, so great an evil, as to require the death of his Son to expiate it; and in this additional fact, that the same scheme by which the sinner is pardoned, has a mighty, instrumental influence in making him holy. And who will deny that over the whole plan, mercy sheds her condensed and most attractive radiance; mercy, not merely in saving those who deserve to perish, but in saving them at an expense, which the infinite mind alone can estimate? I observe, farther, that the mediation of Christ illustrates the moral character of God more perfectly, than if the sentence of the law had taken effect in the person of the transgressors. In this case, justice would have had its course, in the same manner that it has, in respect to the rebel angels; and not a murmur of disapprobation would have been heard through the universe. So also would his holiness have been exhibited in a manner, which would have placed his character forever beyond the reach of suspicion. But these attributes, as we have already seen, are not less gloriously manifested in the cross of Christ;—nay, I venture to say that there is not a point in the universe—not even amidst the interminable fires of hell, where they arc seen in such ample illustration. But this scheme of absolute and universal condemnation, though it might proclaim the justice and holiness of God, does not, you perceive, like that; of which the death of Christ is the prominent feature, make provision for the exercise of mercy. The one leaves the sinner to the strict exactions of justice; the other, in a way perfectly consistent with the claims of justice, provides for his salvation; and in doing so, develops one of the loveliest attributes of Jehovah ;—an attribute, which, so far as we know, has never been displayed to the universe, except through the mediation of Christ.